The Private school student parents’ forum here alleged that the prolonged silence of the state government indicates that they are lending indirect support to irregularities of private schools. They state that even after direction been issued through department of Higher Education Himachal Pradesh, the private continue to levy unnecessary charges. They said that the second phase of agitation shall be done outside Chapslee school on 28th of March. They said that the students of this school, who had taken admission in plus one class after completion of 10th, are being charged multifold (Against the norm). In comparison to class 10th fee, the private school is charging 232% times higher fee from those seeking admission to plus one. “The school had charged around twenty eight thousand as fee in class 10th . Whereas the same students in plus one are being charged fee ranging from 63000 to 65000,” stated Vijender Mehra, an agitator. He said that the forum is demanding inception of a regulatory commission, which if not fulfilled will result in an even bigger agitation. The forum is planning a state level agitation on the 8th of April, wherein thousands of parents shall hold protest outside the higher education department. The forum demands that the responsibility of the department does finish after issuance of a direction to private schools. “It is their responsibility to get the directions adhered too, stated Mehra. Meanwhile, the department of Higher Education told HimachalScape that they had held a meeting with the private school association. The association has been instructed to submit, fee receipts, expenses and other related accounts as verified through Chartered Accountants within 7 days. The department informed that some schools had submitted their accounts, but mostly did not. The department further informed that they have instructed schools, to not raise the fee more than 8% per annum (in light of the court order by Haryana and HP High courts). 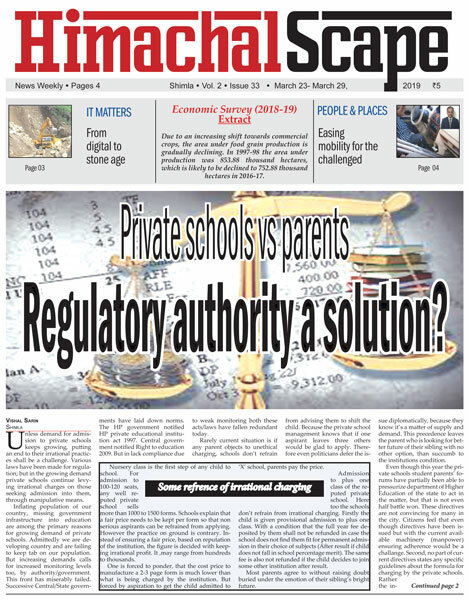 However when HimachalScape told the department about the allegation furnished by the parent forum, they state “So far no one has come to us with a written complaint, after we issued directions to private schools, therefore we are assuming the matter is resolved,” stated Dr. Chandreshwar Sharma, Joint Director of the department.